We love getting your feedback! 10/14/18, Abhay J. writes, “Hi Angelo, Sorry for the delay but I want to thank you so much for the wonderful tour! The entire squad had a fantastic time last Sunday. We will definitely recommend you to all of our friends! 8/14/17, Susan L. writes, “Just want to thank you for yesterday. Everything worked out perfectly and Gina was amazing. Fun was had by all. I will definitely recommend you to everyone I know. Thanks again, Susan. 6/26/17, Liz H. writes, “Hi Angelo, I just wanted to say thank you for Saturday and let you know how wonderful it was. The staff and food were excellent! I would definitely use your company again and will refer friends and family to you as well. 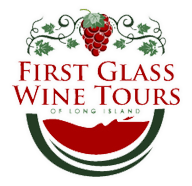 6/13/17, Samantha A. writes, “I can't say enough good things about First Glass Wine Tours. 6/7/17, Sandy L. writes, “thank you so much for a wonderful time. 5/22/17, Ashley M. writes, “I have to start by saying this experience was absolutely excellent! From working with you on planning this trip and the whole day itself with Gina. Gina is absolutely amazing, everyone enjoyed her with taking photos throughout the whole day and just being for engaging with us throughout the day! The minibus we took was perfect, very clean, and enjoyable for the day. Having lunch at Laurel Lake was the best decision made (Thank you for this recommendation!). The food was delicious - the spinach dip was a hit for our age group of the mid-20s! Everyone enjoyed the whole day and I have gotten comments all day and after how everyone had a great time and would love to do this again! I would highly recommend your company to anyone and look forward to working with you in the future! 8/19/16, Jennifer A. writes, “Customer service was phenomenal start to finish. From the booking to the day of our event and Tommy made our experience incredible and our day easier! Our time with your company was everything we could have asked for! Tommy was a fantastic driver and gave awesome recommendations about each vineyard that we visited =) your company and attention to detail made the planning easy and our day flawless! I cannot thank you enough for helping celebrate my sister's bachelorette! 8/7/16, Kerri M. writes, “ I just want to thank you very much for my day yesterday. Our driver David was wonderful!!! I can't say enough good things about him. I'm recommending your company and him to all my friends and family! We will definitely see you again!" 4/11/16, Kristina M. writes, “Angelo was great, he answered all questions we had and was very knowledgeable about all the Vineyards ! He always responded to me quickly any time I called or emailed him. His staff was great with setting up and serving us lunch! The food was amazing, it was beautifully presented and the food was extremely fresh and delicious.. The limo was very clean and comfortable. Danny, our Driver, was great, very friendly and got us to our destination safe and sound! Our wine tour was a great price, very affordable and we would definitely plan another trip with them!! 10/23/15, Rachel T. writes, “Thank you so much Angelo. We had a great time! Most important, the bachelorette herself had a great time! You and your staff exceeded all of our expectations! It was an absolutely perfect day. Thank you again! We will definitely be recommending your tour group! 10/18/15, Kim J. writes, ” Thank you thank you thank you !!!!! 8/24/15, Daina R. writes ” I wanted to say thank you very much for the wonderful day Saturday! Your staff is truly wonderful and welcoming. The bride and groom were very pleased and everyone was ranting and raving about the food and how helpful you all were! 7/30/15, Laura S. writes, “Our outing to the vineyards on the North Fork went smoothly. All of the 16 people in our group enjoyed themselves and everyone had a smile on their face at the end of the day. Customer service is accessible and approachable. Angelo is easy to talk to and genuinely wants to plan a nice day for his guests. Our driver was professional and got us everywhere we needed to go safely. Our vehicle was clean and sat all the guests comfortably. Value for the package was very reasonable. All in all service, transportation and lunch were wonderful.